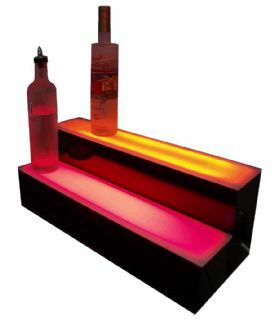 The Illuminated Bar plinth is what transforms bars into happy moods. The front and sides are made of a strong aluminium material sprayed to the colour of your choice. Have a single color or alternating RGB color changing effect. The Illuminated Bar plinth is what transforms bars into happy moods. This awesome eye catching 2 level plinth has 9 illuminated color options. Have a single color or alternating RGB color changing effect. Easy assembly with visual eye catching lighting. The front and sides are made of a strong aluminium material sprayed to the colour of your choice. The top is made from a shatter proof frosted acrylic material. For easy maneuvering the bar is made light weight with plug and switch easy power up. Option to screw down if needed. Available illumination : Red,White,Yellow,Pink,Purple,Blue,Green,Orange & RGB. Bar Stand available in : Black, White, Brown, Silver, Gold, Grey,Cream, Purple, Yellow, Red, Green & Blue. Other colours on request. 3 Different sizes available : H 310mm x D 310mm x L 1000mm, H 310mm x D 310mm x L 2000mm, H 310mm x D 310mm x L 3000mm. Other sizes available on request. Switch mounted to side for easy access to turn off at night. Power : 3 pin, 240v, 5amp, plug. The standard lighting is in fluorecent, option to have LED's. Perfect for the top of a bar to illuminate drink bottles.